Vendhaya keerai paruppu usili is a healthy and tasty South Indian style curry that goes well with Rasam and Morkuzhambu. Methi leaves are a fantastic food for Diabetic people since it controls the blood sugar levels. 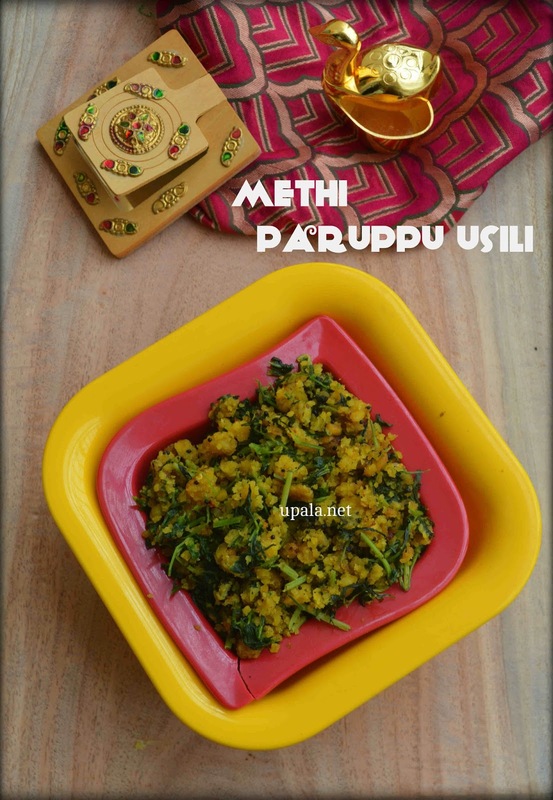 This methi paruppu usili is cooked with the combination of methi leaves and dals and hence rich in fibre and protein. 1) Soak Toor dal and Channa dal for half an hour. 2) Mean time, wash and clean the fenugreek leaves then finely chop and set aside. I have used the tender stem part along with the leaves. 3) After half an hour, drain water and coarsely grind the dals with salt, turmeric powder, hing, red chillies. 4) Heat 1 ladle oil in a kadai and add mustard seeds to crackle. Next add ground dal and fry them in oil till they get cooked and turn slightly crispy. 5) Transfer the fried dals to a plate and heat 1 tbsp oil in the same kadai. 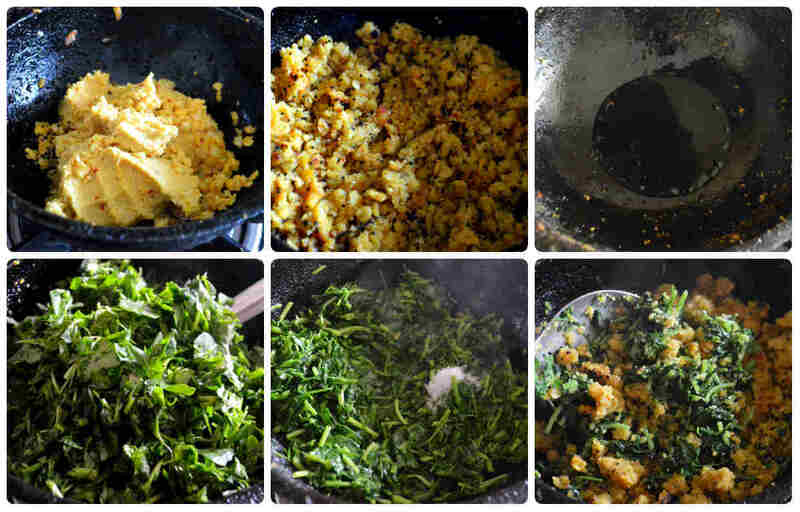 6) Drop in the chopped fenugreek leaves and fry till they shrink in size. 7) Now add salt and mix well. Fry the leaves for few more minutes so that the raw smell goes off. 8) Now, add the fried dal mixture and mix well. 9) Switch off the flame after 2 mins. 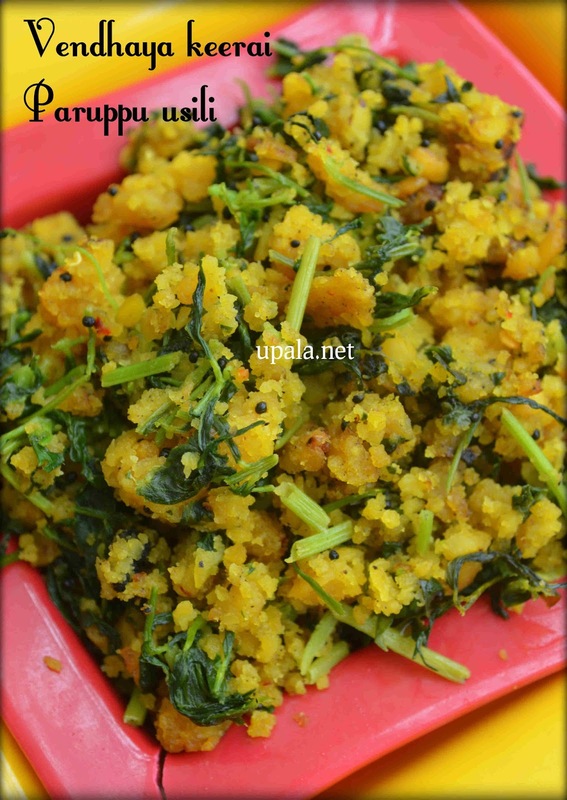 Healthy and Yummy Vendhaya keerai paruppu usili is ready. 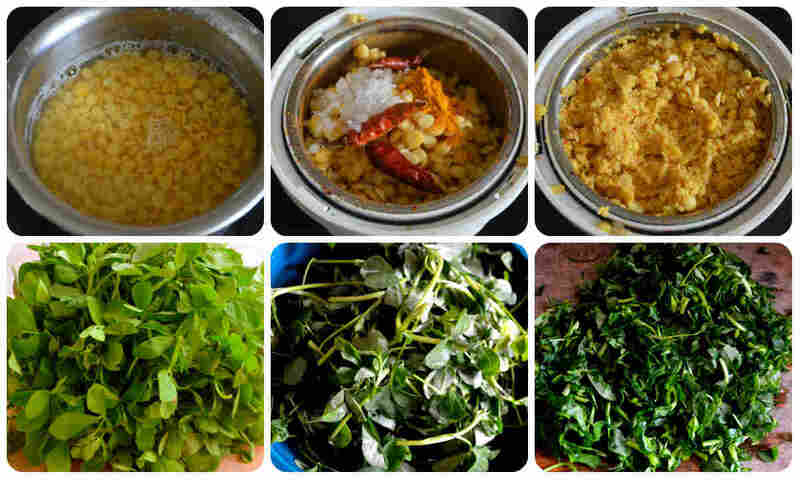 1) There are two ways to do paruppu usili, you can either steam it after grinding the dals or you can fry as I suggested in above steps. For detailed procedure, click here. 2) Fenugreek leaves shrink a lot so if you use 1 big bunch it will shrink to 1 cup size after sauteing in oil.